A poll released Tuesday by the Philippine firm Social Weather Systems (SWS) found that 84 percent of respondents nationwide believed it was “not right” for President Rodrigo Duterte to refuse to challenge China over its ongoing colonization of Philippine territory in the South China Sea. The number, from a poll conducted in September, is three percentage points higher than the last time the question was asked in June. SWS published the poll results as Chinese Communist Party leader Xi Jinping landed in Manila, the first visit by a Chinese head of state to the country in 13 years. Philippine citizens greeted Xi with widespread protests calling for China to stop violating the Philippines’ sovereignty and mockery online, where citizens took to posting photos of Winnie the Pooh to mock Xi’s large belly. Posting images of Winnie the Pooh online is illegal in China. The poll, conducted between September 15 to 23,” found 84 percent of respondents saying that the Philippines should not “leave China alone with its infrastructure and military presence in the claimed territories.” Another 86 percent said it was “right” for Duterte to invest in strengthening national defense in response to Chinese threats, and 71 percent expressed a desire to see Duterte appeal to international legal organizations to expel China from the Philippine territory it has colonized. As the number who disapprove of the current Duterte strategy went up three points since the last poll, so too did the number hoping to see Duterte engage in a diplomatic solution to the situation go down by three points. The poll found near unanimous agreement that expelling China from the Philippine South China Sea was “important”: 87 percent of respondents said the Philippines must “regain control of the islands occupied by China in the West Philippine Sea.” The term “West Philippine Sea” is often used in the country to describe the part of the South China Sea that falls into the country’s sovereign territory. The number of Philippine respondents eager to see Duterte confront China in the latest poll is higher than both prior results in SWS surveys and in other polls. In July, the Stratbase ADR Institute found that 73 percent of Filipino wanted to see Duterte actively confront China in the South China Sea. Duterte made clear this week that any attempt to confront China was unlikely to occur. Xi published an editorial piece in various Philippine newspapers before landing in Manila announcing that the dispute between the two countries was over, and both sides could now enjoy “the rainbow after the rain.” Duterte greeted Xi warmly and agreed to 29 deals on infrastructure, cultural exchanges, government aid, and other development. Among the most controversial agreements is a deal to allow China to drill for oil and gas in the Philippine South China Sea. Duterte has repeatedly refused to challenge China in the region because, he says, the People’s Liberation Army (PLA) would “massacre” the Philippine military, a remark that has insulted many in the country. Duterte has also joked that the Philippines could one day become a “province” of China. China claims most of the South China Sea, including territory belonging to Brunei, Taiwan, Vietnam, the Philippines, Malaysia, and Indonesia. It has illegally constructed artificial islands on reefs in the Spratly Islands, jointly possessed by the Philippines and Vietnam, and armed them with advanced military equipment. China insists the development is civilian and legal, despite a 2016 international court ruling finding the activity violates the United Nations Convention on the Law of the Sea (UNCLOS). On Wednesday, a new study by the Asia Maritime Transparency Initiative of Washington’s Centre for Strategic and International Studies revealed satellite images showing further illegal construction in the region. This development appears to be the construction of an artificial island on Bombay Reef in the Paracel Islands, legally Vietnamese territory. Duterte’s presidential spokesman Salvador Panelo responded to the SWS poll this week by condemning the firm. “Our country’s renewed ties with our giant neighbor in the North provides us a welcome opportunity for the public to know and understand China better. It does not happen overnight but we are confident that a more favorable public appreciation of China would happen in the future,” he concluded. Defense Secretary Delfin Lorenzana made similar remarks on Wednesday. “I doubt the results of the survey. You can manipulate the survey to suit your conclusion. 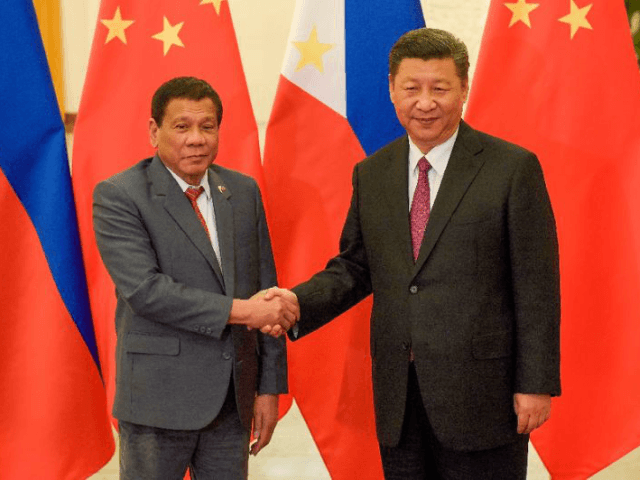 So, the timing of the arrival of Xi makes it more questionable to me,” he remarked, according to the Philippine Inquirer.